What is the Green Check Program? Green Check is a certification program that provides businesses and organizations with resources they need to become more sustainable. Organizations have the opportunity to join the Green Check program free of charge by committing to focus on sustainability efforts in the areas of waste reduction, energy efficiency, and / or water quality. Members of the program can achieve higher levels of certification (Bronze, Silver, or Gold) by earning minimum scores on our Green Check sustainability assessment. Organizations that earn certification can see benefits in their branding and marketing strategies, cost savings, higher revenue generation, employee retention and satisfaction, and customer loyalty within their communities. All tiers of the Green Check Certification program, and all resources provided to organizations as part of the program are completely free within Fayette County. What types of organizations are eligible to take part in the program? The Green Check program is open to Fayette County businesses and organizations of all types and sizes. The program applies to a wide range of sectors including, but not limited to: retail, restaurants, groceries/markets, apartments, manufacturing/industry, & non-profit organizations. The only requirements are a willingness to assess your current green efforts, identify new strategies, and implement initiatives to increase your sustainability. The Green Check program is completely free of charge to any business/organization within the Fayette county area. This includes all trainings, consultations, promotion and branding materials provided by Bluegrass Greensource. What is the process for becoming Green Check Certified? Bluegrass Greensource will work with you at your convenience to set up a personal sustainability consultation to review your current sustainable initiatives and complete the Green Check Sustainability Scorecard. Upon completion of the Green Check Scorecard, you will receive a report that details your current sustainability efforts, establishes a baseline sustainability score, and identifies potential areas for improvement. After highlighting opportunities for improvements, Bluegrass Greensource will assist your business or organization in developing new strategies to address current shortcomings and expand upon areas in which your organization already excels. Bluegrass Greensource will check in throughout the year to review your organization’s progress, offer advice, and assist in the implementation process of your sustainability strategies. As you complete new initiatives, let us know and we will update your scorecard to provide an evolving picture of your progress as you move towards the ultimate goal of becoming Green Check Certified. 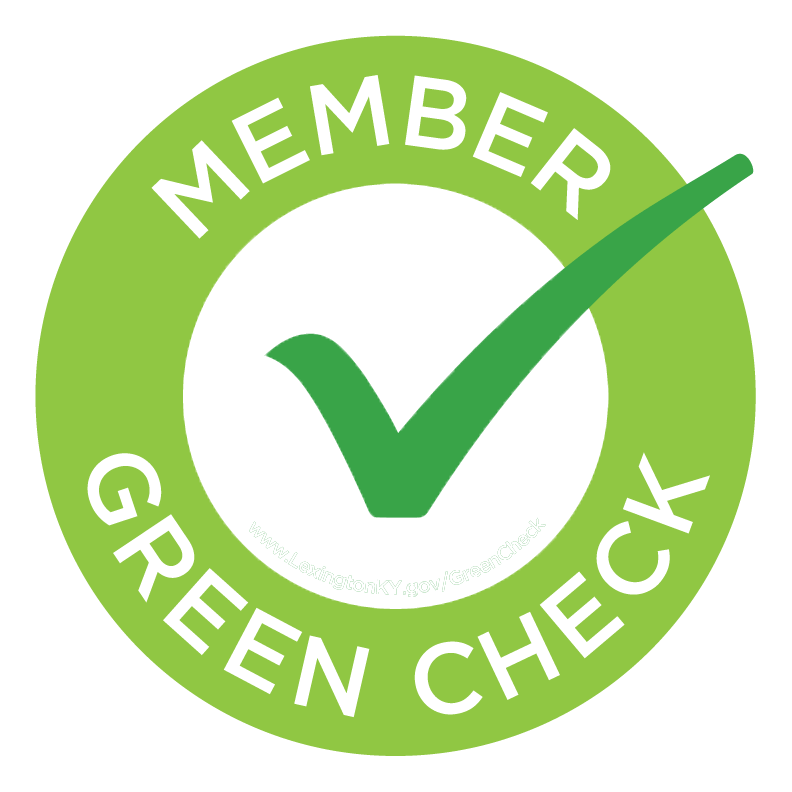 Although basic membership has its perks, in order to realize the full benefits of the Green Check Program, members are highly encouraged to continue to expand their sustainable initiatives and strive to reach the Bronze, Silver and Gold Membership Tiers. A reasonable expectation is that certification will take a minimum of 30 days from the time that the process is started. Depending on the time of year and the number of businesses currently applying for certification, the process could take longer. This time estimate includes initial consultation, completion of the scorecard, verification, and documentation of the certification. This estimate does not include the time needed to complete your initiatives internally, some of which could take much longer. Are there any initiatives that are required to become certified? Each section of the Green Check Scorecard contains certain initiatives that are prerequisites to certification. These initiatives are clearly marked within the scorecard and provide a great starting point as you begin to implement sustainable efforts within your business or organization. What if my business or organization has green initiatives that do not appear on the scorecard? The Green Check Scorecard contains an “Innovation Points” section that allows for businesses and organizations to share innovative green practices they have undertaken that are not otherwise covered within the scorecard. How does Bluegrass Greensource verify that actions are completed? Bluegrass Greensource staff will come to your organization at a time of your choosing to conduct a personal consultation and assist in completing the Green Check Scorecard. In addition, we will work with your Green Team or Sustainability Coordinator to verify completion of activities on the scorecard during the certification process. Bluegrass Greensource will also be available at any time to provide support and advice for helping identify areas of improvement and to update your scorecard as new initiatives are implemented. How does the Green Check Certified tier system work? Can my business or organization move into a higher tier if we are already certified? Yes! The Green Check program is designed to help you build upon your initiatives as you strive for higher certification levels. While attaining a Bronze certification is a commendable achievement in its own right, we hope you will continue to develop your sustainability programs and strive towards Silver and Gold Certification status. What if my organization does not have the resources to make the recommended changes? Keep going! There is no time limit for certification. We understand that some initiatives take longer and are more costly than others, and the Green Check Scorecard is designed so that even small steps can add up towards your goal of sustainability. We are here to help you every step of the certification process and can also help you find resources to potentially lower your costs along the way. We’re here to help. What if I don’t own or manage a business or organization? Even if you are not a business owner, director, or manager, you can still play a vital role in the Green Check program. There are many ways to get involved. Ask your favorite businesses if they are Green Check Certified. Advocate within your own workplace or organizations to which you belong. One of the most influential ways you can contribute is by supporting businesses and organizations and their sustainable efforts through your patronage. Stay connected with Green Check businesses by joining the Green Check Sustainable Business Network group on LinkedIn.